My middle daughter lives in Durango and spends her free time scaling mountain faces in Colorado and Utah or sea kayaking in New Zealand. Her mother's oversensitivity to heights and being on the edge of a space is nowhere to be found in her DNA. When she walks through the room and hears my son and I arguing over concepts of time and space, she rolls her eyes and gives us her well practiced look of disdain. Last week when my son was home visiting from New Orleans, he suggested I read the work of Edward T. Hall. I innately function in polychronic time, so reading about cultures who honor, rather than reject that view and pace of life, has been interesting to me. But more than a justification for habits developed in childhood that have remained for 50 years, I have been excited by the concepts in Hall's study of proxemics and communication. The visual art I create is non-verbal communication. Wonderful Edie Carpenter, who also loves Gaston Bachelard's "Poetics of Space" and his writings on phenomenology, gave me a platform to discuss how the viewers' interaction with space is so important to me as a painter at the February NC Art Outreach Project at Greenhill. We experience space. We are conscious of space. As painter I want to put the viewer "in" the space. Hall's intimate proxemic is captured, for example, by filmmakers with a close up shot; a long view reveals the public or territorial proxemic. But I believe art is understood beyond conscious experience. What if we can experience the intimate proxemic via the public? The flat surface of the painting (or a film screen) can become a portal that transports the viewer to the space the artist is experiencing at the time of the creating (or painting or filming). And by the painter limiting the amount of visual information given to the viewer, the viewer subconsciously "fills in the blanks" and experiences the actual space themselves, transcending traditional perceptions of chronological space and time and our pervasive monochronic time system as described by Hall. Through that portal the public proxemic becomes the intimate. "Greenhill" as "A Space for NC Art" creates a space for those of us in the NC art community to transcend walls to a more far-reaching conceptual space. Where those of us working, often isolated from other artists, far apart geographically and conceptually, can come together and invigorate, inspire and challenge each other as artists. 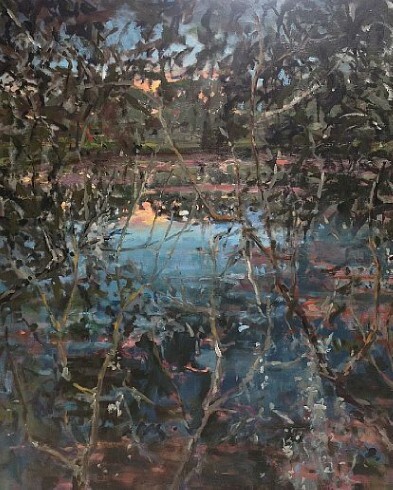 Where artists connect with collectors who have supported this NC artist through their Winter Show purchases and shared excitement about work they may not have seen without Edie's great curatorial eyes. Where all those joyful questions are first asked during rambunctious ArtQuest sessions. Where Greensboro tells a bigger realm that things are still happening there. The new "Greenhill" name conjures up a space that is more than just a place. It seems appropriate, and big enough to encompass the entirety of what that place is... and what happens as a result... a really big NC space. So congratulations, Greenhill; good new name. City Park, New Orleans; 2013; oil on linen; 60" x 46"
Gloria - The writing...the mystery in the painting...I'm just humbled by all of this.